The committee of khap leaders of Haryana today decided to extend the deadline for the Haryana government to announce reservation in government jobs for Jats by three days. Two sisters whose marriages were scheduled to take place today could not tie the nuptial knot after a row erupted over the gotra of the girls’ and the boys’ families. The ceremony had to be cancelled after the caste panchayat declared that the marriages could not take place due to clash of gotras on both sides. The marriage was called off after the decision was accepted by the parents of the girls. It was a near action day in the Haryana Vidhan Sabha as the House nearly formed a committee to look into the “disputed ownership” of the Miri Piri medical college coming up at Shahbad. Doctors in the Fatehabad General Hospital are alleged to have shown the door to a pregnant woman, who was brought here for her delivery. The woman Peet Kaur’s husband, Hunny, has said in a complaint to the authorities that he took his wife, who was in labour, to the hospital at 10 pm yesterday. Haryana Food and Supplies Minister Mahender Pratap Singh today said about 56 lakh eligible families of the state would be issued Smart Ration Cards under various categories. As many as 40 children had a narrow escape when an overloaded school van collided with another vehicle while overtaking it at Ratia in Fatehabad today. Digging deep into the issue of illegal mining in Haryana, the Punjab and Haryana High Court today asked the state to inform the Bench why an officer should not be deputed to initiate action against police officials and other employees conniving in “such activities”. The Supreme Court has expressed “deep concern” over Haryana’s move to allow quarrying in the riverbeds of Yamuna, Tangri, Markanda and Ghaggar and in the Krishnavati and Dohan river basins through auction notices issued on June 3, 2011 and August 8, 2011. Hundreds of vehicles were stranded and passengers were a harried lot as Bhartiya Kisan Union (BKU) activists blocked Delhi-Ambala National Highway No. 1 at Pipli for several hours to protest against the reluctance of the police to arrest the farmers courting arrest. Teachers of Guru Jambheshwar University of Science and Technology staged a dharna here today in protest against the failure of the Haryana government to issue a notification granting new pay scales to teachers of technical universities. 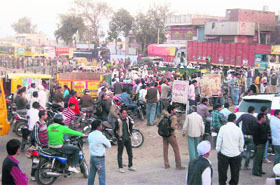 Tension gripped Chandrao village near here as villagers opposing setting up of a liquor factory confronted officials of a promoter company RSL and the teams of the central and sate pollution board officials who reached the village for the survey of the proposed site. A Rabi Kisan Mela organised by the Central Soil Salinity Research Institute (CSSRI) to provide a platform for farmers to interact with scientists and get update about the latest technologies and products in the farm sector, was a big success with more than 3,000 farmers and students interacting with farm scientists and seeking information about ways to combat the climate change and tackle the problem of soil salinity. Warning the UPA government against going ahead with its move to provide reservations for Muslims within the 27 per cent OBC quota, Praveen Togadia, international working president of the Vishwa Hindu Parishad (VHP), today said that the “sinister” move was politically motivated and fraught with dangerous consequences. Rapped on the knuckles for his failure to appear before the Punjab and Haryana High Court and inability of cops under him to back the state counsel in criminal cases, the Gurgaon Commissioner of Police was today asked to ensure that law officers were adequately assisted by officials well acquainted with cases. Representatives of different khaps of Haryana met at Jat Dharamshala at Hansi, about 25 km from here. Sube Singh Samain, spokesperson for the khaps,said they had decided to extend the deadline as Chief Minister Bhupinder Singh Hooda was busy because of a close relative’s death. However, the agitation would continue, he said. Sube Singh said the khap leaders had prepared “their agenda” regarding their demands but it would not be disclosed for now. If khap leaders were invited for talks, this agenda would be disclosed to the Chief Minister. Otherwise, khap leaders would decide their next course of action. He said the number of khaps representatives rose to 31 today as khaps from Rohtak, Jhajjar and Sonepat districts also joined the meeting. On the other hand, All-India Jat Aarakshan Sangharsh Samiti leader Ram Bhagat Malik said activists of the samiti would meet at Mayyar village near here tomorrow to decide the next course of action. He said the samiti would take its own decision and the khaps were free to support the samiti. However, if khaps differed from the samiti point of view, the samiti would charter its own course. Regarding Malik’s announcement, Sube Singh said the khaps had taken their decision and some persons were entitled to their own views. The agitation in its current phase has been marred by differences among different leaders who had led the stir last year. Hawa Singh Sangwan, president of the Haryana unit of the samiti, was the first to express a different point of view. Sangwan dissociated from the stir, saying that he would wait till the Haryana Backward Classes Commission submitted its report and the election process in UP was over. Thereafter, leaders organising the agitation have had serious differences of opinion. Under the circumstances, khap leaders intervened and they met Chief Minister Bhupinder Singh Hooda twice. However, the talks yielded no result. The differences between the samiti and khap representatives, which surfaced today, indicated a new divide between Jat leaders supporting the stir. Meanwhile, protesters continued to squat on both sides of the rail track for the 12th day today undeterred by the differences . Rail traffic on the track has been suspended since the agitation began. Reports said the victims in this case hailed from Jalalpura village of the district. A panchayat was held on the marriages issue at Jalalpura Kalan village on Wednesday. The panchayat said the matrimonial alliances fixed by the father of the girls about two years ago to the boys hailing from Jajanwala village in the district were not acceptable socially due to the gotra factor. While the gotra of the grandmother of the boys was Bhayan, any boy or girl hailing from this gotra could not be married to a partner belonging to Jaglan, Chopra and Goyat surnames as these gotras had brotherly relations. The girls hail from Jaglan gotra. The decision to break the alliances was announced to the girls’ family a day before the marriages. The matter was resolved amicably and without any opposition or protest from anyone, added Sunil Kumar, sarpanch of Bibipur village, who was present at the meeting yesterday. While this issue generated a lot of heat among the treasury benches and the Opposition, the House also came close to suspending BJP’s Anij Vij for casting aspersions on the Speaker’s chair. The issues of allotment of 100 sq yard plots to the BPL families and the setting up of the nuclear power plant in Sirsa, too, were hotly debated as the benches on either side traded charges. The Miri Pri “explosion” began in an innocuous manner when first-time MLA Anil Dhantori, after resumption of the discussion on the Governor’s address, applauded the government for opening three medical colleges. INLD state chief Ashok Arora intervened, urging him to get the Miri Piri college in his area completed with government help. At this, Parliamentary Affairs Minister Randeep Singh Surjewala responded by saying that the college was being run with funding from the SGPC while maintaining that Punjab Chief Minister Prakash Singh Badal and his son were lifetime trustees. “The SGPC takes the offerings from Haryana’s gurdrwas and a family uses these for a medical college of its Trust. If there is anybody who can help in getting the college completed, it is INLD supremo Om Prakash Chautala,” he said. At this, Chautala accused Surjewala of “making a joke” of the SGCP-funded college even as Finance Minister HS Chatha warned Chautala against dragging the Sikh community unnecessarily into a controversy. Surjewala said the college was being made using the SGPC funds. “This money belongs to the Sikhs of Haryana and nobody has given one family the right to use it. Let the House form a committee on this and summon me, Chautala and the record of the Miri Piri and bring a privilige motion against whoever is wrong,” he stated. At this, Sher Singh Badshami “admitted” that there was nothing wrong in being trustees and with this admission the matter ended. INLD MLA Rampal Majra said the 100 sq yard plots to BPL families and the SC families had not been allotted while panchayat land was being used to make allotments elsewhere. Members of the treasury benches sought to know whether the INLD government, in its term, had not thought of using this land for these families and asked the Opposition if it had given even an inch of land to the poor. The other big issue that rocked the House was the coming of the nuclear plant to Sirsa. Majra alleged the plant would be hazardous to health and cause cancer. To this, Surjewala said these fears were unfounded and the INLD was trying to mislead the people. The Power Minister, Capt Ajay singh Yadav, claimed that 80 per cent farmers were in agreement on giving away the land while 20 per cent of them were being misled by the Opposition. On being asked by the Speaker, Kuldeep Sharma, if the INLD was against the setting up of the plant, the members replied in the affirmative. Earlier, immediately after the question hour, the Opposition wanted a discussion on damage to the crops due to frost. The Speaker informed the House that he had sought the government’s comments. Though the INLD in line and accepted this, Anil Vij trooped into the well and began arguing with the Speaker to let him speak, failing which he would not return to his seat. Despite warnings, he refused to go back and alleged that the Speaker did not give them time. When he refused to budge, Surjewala brought a resolution seeking his suspension. However, this was withdrawn after INLD’s Ajay Chautala brought Vij back to his seat and requested the Speaker to drop the resolution. He alleged that the doctors told him that his wife might need a caesarian section to deliver her baby, but they did not have the services of an anaesthetist here. He said he had to rush his wife to Maharaja Agarsen Medical College at Agroha in the night. Hunny has demanded action against the doctors for denying delivery facilities to his wife. “On the one hand, the state government claims that it has been promoting institutional deliveries in Haryana, on the other hand doctors in the district-level General Hospital have been denying delivery facilities to people,” he alleged. The Civil Surgeon, Dr Suraj Bhan Kamboj, admitted that there was no anaesthetist in the hospital, but he denied that the hospital authorities had denied delivery facilities to the woman. Haryana has the privilege of introducing a Smart Card project, which is a pilot project of the Government of India and has been introduced only in Haryana and Chandigarh. The minister was replying to a calling attention notice submitted by MLA Bharat Bhushan Batra in the ongoing session of the Haryana Vidhan Sabha today. The minister said the state government was committed to streamlining the working of the public distribution system in the state. The Smart Card project provides a technology solution to the problems of leakage and diversion in the public distribution system. In the first phase of the project, four blocks namely Ambala, Sirsa, Sonepat and Gharaunda havdbeen selected on pilot basis. Taking up a petition by Panchkula resident Rajesh Kumar for anticipatory bail in an alleged illegal mining case, Justice Ranjit Singh asserted: Notice is issued to the state counsel for March 16 as to why a senior officer be not deputed to go into all aspects and take action in case any staff or police officials are conniving in such activities”. The directions come at a time when the Supreme Court has already made it clear in the Deepak Kumar versus state of Haryana case that “leases for mining of minerals, including their renewal, for an area of less than five hectares be granted by the states/Union Territories only after getting environmental clearance from the Ministry of Environment and Forests”. Taking note of the issue, Justice Ranjit Singh asserted: “Even the Supreme Court is seized of the issue arising out of illegal mining in the state. Still, persons like the petitioner commit theft of mines with impunity. Apparently, this cannot be done without connivance by staff”. Declining the anticipatory bail plea, Justice Ranjit Singh added: “It is seen that a tractor-trolley was seized at the scene whereas the person ran away. This is usually noticed in each and every case”. Rajesh Kumar was booked on February 4 under the provisions of the Mines Act and also for theft, criminal conspiracy and other offences. The FIR was registered at Chandimandir police station. “Rivers mentioned in the auction notices are on the foothills of the fragile Shivalik hills. Shivalik hills are the source of rivers like Ghaggar, Tangri and Markanda,” a Bench comprising Justices KS Radhakrishnan and CK Prasad noted. “We are expressing our deep concern since we are faced with a situation where the auction notices have permitted quarrying mining and removal of sand from in-stream and upstream of several rivers which may have serious environmental impact on ephemeral, seasonal and perennial rivers and riverbeds. Sand extraction may have an adverse effect on biodiversity as well,” the Bench pointed out in the February 27 judgment. The SC pointed out that extraction of alluvial material within or near a river bed would have an adverse impact on the river’s physical habitat characteristics like river stability, flood risk, environmental degradation, loss of habitat and decline in biodiversity. The SC suggested that there should be a “comprehensive mines plan” for contiguous stretches of mineral deposits by the state governments and its incorporation in the Mineral Concession Rules, 1960, by the Ministry of Mines. Hundreds of farmers from Haryana and adjoining states, who had assembled for the Maha Sangram rally at Pipli Anaj Mandi on the call of the BKU, courted arrest. But the police rounded up some leaders and did not arrest the agitating farmers. Enraged by the attitude of the police in not arresting the farmers courting arrest, the farmers alleged that it was a clever move to foil their ”jail bharo” agitation and insisted that they should be arrested and sent to jail. The police arrested some prominent BKU leaders, including Rajesh Tikath, son of former BKU president Mahender Singh Tikait, and state president of the BKU, Gurnam Singh. The blockade of NH 1, which started around 4.30 pm, continued and the district administration was holding parleys with BKU leaders to lift the roadblock. The BKU is demanding implementation of the recommendation of the Swaminathan Committee report that the MSP of crops be fixed on the basis of the actual cost of production plus 50 per cent profit to make agriculture sustainable. Gurnam Singh said the debt-ridden farmers were committing suicides every day but the government was unmoved and the main thrust of the agitation was to focus attention of the government on the plight of the farmers and acceptance of their demands. IG, Karnal range, Balbir Singh, Deputy Commissioner, Kurukshetra, Mandip Singh Brar, and SP, Parul Kush Jain, rushed to Pipli and were holding talks with BKU leaders to lift the blockade. Sandeep Rana, working president of the Federation of Haryana University Teachers Associations (FEDHUTA), said the notification had been pending for over an year. In the absence of the notification the universities had been keeping promotions of teachers in abeyance since 2009. He said a panel set up by the government to draft a notification had given its report last year but despite that no notification had been issued. Teachers of other universities and colleges had already been granted the revised pay scales. Sonepat: The Teachers Association of Deenbandhu Chhotu Ram University of Science and Technology DCR, Murthal, on Thursday organised a dharna on the university campus against the delay in release of the comprehensive notification regarding revised pay scales for technical university teachers in the state. Dr Rajiv Kumar, president of the association, said if the notification was not released by March 14, the agitation would be intensified. “They will wear black badges on March 15 and it will be followed by boycott of all additional duties in the university from March 16,”he added. A large number of villagers from more than six villages assembled at Chandrao and made it clear to the RSL officials and the district administration that they would not allow the liquor factory to come up at any cost. The villagers refused to listen to the pleas of the promoters and ADM MK Pandurang that their objections would be heard and some amicable solution would be found and said the proposed factory would increase pollution, deteriorate the quality of land and ruin several households. A large number of sarpanches who had assembled at the village declared that they would come on the streets in case the government allowed the company to set up the unit. The farmers were informed about the technologies developed at the CSSRI for reclamation of salt-affected soils, use of poor quality water, crop diversification, salt tolerant and less water-consuming varieties of rice and wheat and a huge quantity of seeds of rice varieties like Pusa 44, Pusa 1121, CSR 10, 13, 23, 27, 30 and 36 were sold during the mela. Dr Gurbachan Singh, chairman, the Agricultural Scientists Recruitment Board (ASRB), who inaugurated the mela, exhorted the youth to develop a scientific approach and adopt scientific farming to contribute towards food security. “The Union government cheated the OBCs on December 22 last year by giving 4.5 per cent reservations to the Muslims within the 27 per cent quota and reducing it to 22.5 per cent. It is toeing the line of Mohammad Ali Jinnah, which led to the Partition of the country in 1947,” he said while talking to mediapersons here. Lashing out at the political parties, advocating reservations for Muslims, Togadia said the Rangnath Misra and Rajender Sachar Committee reports should be scrapped as reservation on the basis of religion was unconstitutional and not in the interest of the country. Disputing the claims of the government that a majority of the Muslims were poor and backward, the VHP president said the average income of a Hindu family was Rs 24,000 per annum while the average income of Muslims and Christians was about Rs 42,000 per annum and questioned that how can these religious communities be categorised as ”poor”. He said the Rangnath Committee had recommended 15 per cent jobs in government services and seats in educational institutions for minorities. The directions by Justice Ranjit Singh came soon after the Commissioner appeared before the Bench this morning. Justice Ranjit Singh had on Wednesday warned him of contempt after ruling that his non-appearance before the court was a display of “defiance”. The High Court, on February 17, had asked the Commissioner to appear in person before the court following the failure of the police to assist the state counsel in a dowry death case. Booked under Section 304-B and 120-B of the IPC on May 26, 2011, Jeet Singh and his wife Dhanpati were seeking regular bail in the case. Justice Ranjit Singh had observed: “During the course of arguments, it transpires that the person, who has come to assist the state counsel, is a head constable; and has not even brought the relevant file. A serious case is alleged against the petitioner and the state counsel is not in a position to have access to the course of investigation”. Describing it as “totally undesirable situation”, Justice Ranjit Singh had asked the Commissioner to remain present along with the IO. But, on Wednesday, the Deputy Commissioner (west) appeared before the court instead of the Commissioner. Justice Ranjit Singh then observed: “This shows defiance on the part of the Commissioner, who was directed to remain present”.